QUOTEABLE WATERMELON: THE PERFECT DIET - What About Watermelon? 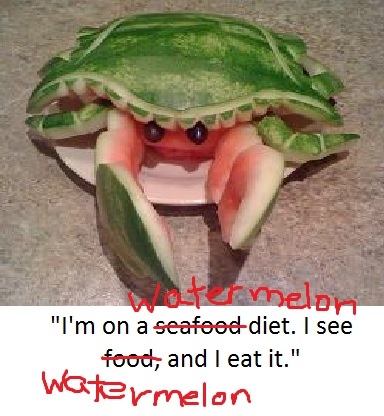 We’ve all heard the anonymous quote above, and I realize my watermelon edits rob it of some of its play-on-words humor, but I like the idea of a watermelon diet, so I’m sticking with it. Of course, a diet consisting solely of watermelon isn’t something I’d recommend. While it might be delicious for a day or two, watermelon is best when it’s part of a larger, balanced diet. Check out dietician Elizabeth Somer’s article on the health benefits of watermelon or my own blog entry about the nutritional benefits of watermelon. Another reason I wouldn’t recommend eating only watermelon for an extended period of time is that you run the risk of getting tired of it. I know, it sounds crazy, right? Getting tired of watermelon? But it can happen, and I don’t want it to happen to you. I remember when I was a kid, my brother and I would go through phases in which we couldn’t get enough of certain foods. One particular craving I remember well was yogurt. Specifically, the single-serve yogurt with the fruit in the bottom of the cup. It drove my mother crazy, so she gave in to our cravings by buying entire cases of yogurt and telling us that we could eat as much as we wanted. So, we did. Two yogurts for breakfast, one after lunch, two more for an afternoon snack, one or two for dessert after dinner. It wasn’t long — probably about a week— before my brother and I had satisfied our yogurt craving and wanted nothing to do with the treat for a long, long time. And that burnout is probably the final reason why I don’t recommend an all-watermelon diet. It’s hard to imagine getting tired of watermelon, but it might happen, and that’s definitely not a good thing.